Want to increase your sales at farmers’ markets? Or, do you plan to sell at a farmers’ market for the first time and could use some selling tips? The number of farmers’ markets has been seeing marked increases over the past several years. More and more people want to buy what you’re growing in your backyard, greenhouse or micro farm. Here are various ways both the individual vendor and the market group as a whole can increase their farmers’ market sales and quality customer traffic to the market. Customers who scan a table of produce with no prices usually don’t want to ask, “H ow much are the radishes?” And then, “How much are the heads of lettuce? The carrots? The kale?” It’s a bother to most, and some are just shy about asking anything, and move on to other vendors without buying before asking for prices on every item they’re curious about. Set out simple but clear signs that give the item’s name, price, and if possible, a little bit more description to create a customer-friendly atmosphere. If there’s only room to put up the name and price close to each item, you could possibly have a separate description sheet nearby. When displays are shallow and parallel to the customers’ walking path, customers feel safer approaching the stands. This way, they don’t have to walk into narrow aisles off their path. If you can hand out free cherry tomatoes, surplus bachelor buttons, goose or peacock feathers, this helps children (and therefore their parents) enjoy the market, and it also helps keep young hands off the saleable merchandise. Naturally, you’ll follow all local and farmers’ market regulations about food sampling and other farm products you offer, but be extra vigilant with children. Picnic tables and other gathering places can greatly benefit a farmers’ market’s customer draw. Such gathering places are usually group efforts, but if your individual booth area has enough space for a stool where someone can sit to tie her shoe or search inside her bag for a moment, you can at least attract people to your area for that reason, and often, people attract people. Just make sure the sitting area doesn’t tend to gather too many visitors which would clog the actual customers who want to get near your booth. Most people love a bargain. And we do live in a competitive capitalistic environment. But farmers’ markets work because no one undercuts the other. Gardeners or backyard farmers otherwise not involved in the market can’t show up late in the season and dump a load of overly cheap extra produce at the market. But, farmers’ markets and even roadside stand owners can satisfy the desire for bargains by offering free taste samples for all ages, adults and kids. They can also try using loss leaders. This is more often seen when regular department stores offer an item at an especially low price, knowing they’ll lose money on it, just to attract customers to come in and buy other products at full (or inflated) prices at the same time. Farmers can agree ahead of time on loss-leader items that are an equal risk for all, or ask each farmer to provide one per week that does not compete with or undercut other vendors. Be sure to never allow one vendor to always be the cheap one of the pack. Those who study why farmers’ markets succeed have found that the actual farmers are one of the biggest draws for the market, and that sales always increase when the farmers, rather than their employees, are present at the market. Friendly contact with farmers can make the difference between a customer stopping off at the supermarket, or returning next Saturday for field-fresh lettuce. If farmers don’t like people – that’s okay, but they need to find another outlet to sell through. One rude vendor can cast a dark cloud over an entire market. These gathering places of farmers and customers are considered one of the greatest public relations programs for agriculture. Having variety among the vendors will bring a greater number of different customers with different needs to the market who may then see something else they hadn’t thought they’d want and make a purchase. A very good mix consists of some unusual items and new crop introductions along with familiar staples that customers can count on. A regular supply of organic, vine-ripened tomatoes, green beans, and lettuce complement such hard-to-find products as fresh trout and just-picked gourmet mushrooms. There are exceptions to the rule of diversification, of course, especially more in the roadside stands rather than the farmers’ markets. For example, there are stands that sell only honey or cut flowers. People come to expect to buy only certain specific items at these. But at a true farmers’ market, mix the exotic gourmet artisan cheese in with backyard cucumbers. An opening day if the market is not year-round is very important. In Bellingham, Washington, a bagpipe band marches around the grounds, the mayor does the “cabbage toss” and fresh cut tulips (a signature crop of nearby farmers) mark the event. Mothers’ Day. Vendors are encouraged to create Mothers’ Day specials of flowers, garden gifts, hanging baskets, and value-added products. Strawberry (or other berry) Festival with special booths for shortcake. Local entertainment. Scheduling local entertainment will attract more customers, including the musician’s own families. The Davis, California market regularly schedules local talent, such as the youth Suzuki strings group, local school bands and the civic choir. Pancake breakfast. In the small town market of St. Mary’s, Ontario, the vendors and board put on a pancake breakfast each month to encourage regulars to return and to attract new customers. The breakfast is made special by using homemade pancake batter, real maple syrup, and fruit that is in season. Chalk Art/Kids’ Day. In conjunction with a local arts association, Bellingham, Washington’s farmer’s market hands out awards for the sidewalk chalk art produced by local citizens, and allows local kids to rent space to sell their wares. Salmon/Corn Festival. A very popular salmon barbecue cooked and served by market vendors is put on by a maritime farmers’ market. August Peak Season. Markets that offer this find creative ways to sell surplus, whether it be with canning demonstrations or free salsa recipes. Fall Harvest Festival. Popular at markets across the country, customers are drawn to pumpkin carving demonstrations, creative scarecrow contests, fresh-pressed apple cider, and a large assortment of ornamental gourds, multi-colored corn and pumpkins that local farmers have been aiming to harvest for this day. One market has expert pumpkin carvers available to carve customers’ pumpkins for a donation, which is given to a local women’s shelter. November Food Drive. Canned foods are collected at the market by volunteers for local food banks, creating a sense of community spirit and goodwill. Closing. A last market day of the season can be enhanced by emphasizing winter storage supplies of squash, honey, preserves and Christmas gifts. People come to the market for the experience, for a sense of community and to meet real farmers. But the most important products they come to buy are fresh-picked, local, vine and tree-ripened produce grown by the vendor, as well as value-added products the farm made from those crops, such as jams or salsas. 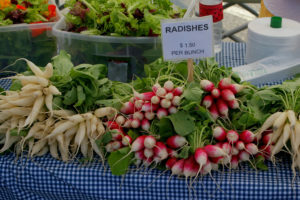 While some markets add a small percentage of permanent craft and entertainment booths, the feel of a farmers’ market is still usually maintained. This can be done through independent market rules that designate only a certain percentage of booths be non-farm related and that all (or a certain percentage of) vendors must grow their own. Or, markets can have formal certification such as in California, where certified markets assure genuine farmers sell their crops directly to the public. These markets are approved by the county agricultural commissioner guaranteeing that certified farmers offer for sale only those agricultural products they grow themselves. In fact, in Washington State, some farmers’ market rules allow market directors to come visit the farmer who wants to be a vendor at the market to make sure what he wants to sell is something he’s actually growing and producing on his own property. For more backyard farming and small acreage farming information, visit MicroEcoFarming.com.